Looking for ways to speak and listen easily and clearly at the same time enjoying hands-free communication when you are hunting, camping or hiking ,Motorola MR355R 4 Pack Weather Proof Talkabout Two Way Radio 35 Mile With VOX Headset Bundle allows you to stay connected while you are hunting, camping or on a weekend outdoor excursion. 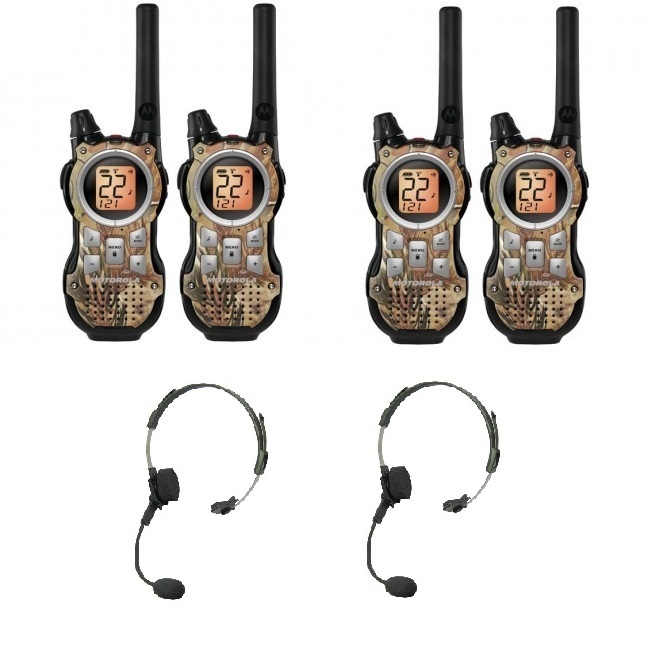 Comes with iVOX support and MOTOROLA 2-Way Radio Accessory (Headset/Swivel Boom Microphone). The headset enables you to definitely hear messages clearly in high noise areas or in quiet conditions without disturbing others. Speak and listen effectively and clearly Experience hands-free communication when The Motorola Talkabout® Headset with Swivel Boom Microphone can be utilised with Voice Activated Transmission (VOX) capable Motorola Talkabout® radios. The headset helps you to hear voice messages clearly in high noise areas or in tranquil surroundings without disturbing others. The boom microphone rejects most road noise, and very soon becomes forgotten during the course of routine use. You”ll have the freedom to send out messages without taking out the radio from your belt or carrying case. MOTOROLA 53725 2-Way Radio Accessory compatible Models. MS, EM, FV500, FV600, FV700, FV800, MH, MJ, MR, SX500, SX600, SX700, SX800, SX900, T5420, T5500, T5710, T5720, T5800, T5900, T6200, T6300, T6400, T6500, T7100, T7200, T7400, T8500, T9500, T9600.